The Millbrook Masonic Lodge #97 fall barbecue will be held on Friday, October 3 from 11:30 am until 7 pm at 2400 New Hope Road in Raleigh. Plates are $7 each and include a choice of pork or chicken, ‘slaw, potatoes, hush puppies, and soft drinks. All proceeds go towards the Masonic charities. We hope to see you all there. Worshipful Brother Lewis William “Bill” Parr passed away on Monday. He will receive a Masonic funeral on Saturday, April 26. His obituary, below, was published in the News & Observer on Monday, April 23. Lewis William Parr, 83, passed away Monday, April 21, 2014 at Rex Hospital after complications from a fall. Lewis was born in Guilford County on December 1, 1930 to the late Louis Edward Parr and Madie Suits Parr. He was a salesman in the communication field selling two-way radios. Lewis was also a fireman with the Greensboro Fire Department for 10 years. He was a member of the Millbrook Masonic Lodge 97 where he served as past Master. He was also a member of the Amran Shrine, where he faithfully served with the Keystone Cops. Lewis was a loving husband, father and grandfather who will be greatly missed. Lewis is survived by his wife: Patricia Wilkinson Parr; sons: Lewis W. “Billy” Parr, Jr. and Robert C. Parr, both of Knightdale; sister-in-law: Rose Sutton of Asheboro; grandchildren: Robin and Emily Parr; great-grandchildren: Hailee, Bianca, Zoe, Bella and Lexie. In addition to his parents, he was preceded in death by his grandson, Joseph Andrew Parr (1995); siblings: Charles, Clyde and Bud Parr and Ruth Melvin. Funeral service will be held at 1:00 pm, Saturday, April 26, 2014 at L. Harold Poole Funeral Service Chapel, 944 Old Knight Road, Knightdale at 1:00 pm. Burial will follow at Brier Creek Memorial Gardens, 7600 ACC Blvd., Raleigh, 27617. The family will receive family and friends prior to the service from 11:00 am to 12:45 pm. Flowers are accepted or memorial contributions may be made to Masonic Home for Children, 600 College Street, Oxford, NC 27565 or Shriners Hospital for Children, c/o Wake County Shrine Club, 6105 Lead Mine Road, Raleigh, NC 27612. Bro. George Calvin Harris passed away in his home on Saturday, Oct. 10, 2013. Bro. Harris was initiated as an Entered Apprentice on April 13, 1971, passed to the degree of Fellowcraft on May 4, 1971, and raised to the sublime degree of Master Mason on June 8, 1971. Masonic rites will be presented by Franklin Lodge #109 on behalf of Millbrook Lodge #97. George Calvin Harris, 73, of Beaufort, formerly of Raleigh, died Saturday, October 12, 2013, at home. A funeral service will be held at 12 Noon, Tuesday, October 15, at Beaufort Original Free Will Baptist Church with the Rev. Bob Lowery and Rev. David Vesper officiating. The interment with Masonic Rites will follow at Carteret Memorial Gardens. He was born in Smithfield, NC on July 20, 1940 to Elzie and Myrtie Jones Harris. Mr. Harris served in the Army National Guard and was a member of Millbrook Masonic Lodge No. 97 in Raleigh. He and his wife owned Millie’s Country Kitchen in Holly Springs and a family care home. Mr. Harris moved to Beaufort 27 years ago where he and his wife own Harris Family Care Home and Wadin Creek Family Care Home in Beaufort. He is survived by his loving wife of 25 years, Mildred K. Harris; sons, Bill Murray, Jr. and wife, Mary, of Georgetown, SC, Steve Murray and wife, Stephanie, of Holly Springs, NC, and Ronald Murray and wife, Lisa, of Holly Springs, NC; his daughters, Monica Whitehead, and husband, James, of Laurinburg, NC and Erin Eaves and husband, Casey, also of Laurinburg, NC; sisters, Louise Elmore of Wendell, NC and Judy Shirley of Knightdale, NC; brother, Lynwood Harris of Spartanburg, SC; 11 grandchildren; 8 great-grandchildren. In lieu of flowers, memorial donations may be made to Carteret General Hospital Foundation for Hospice/Home Health Fund, P. O. Drawer 1619, Morehead City, NC 28557. The family wishes to thank their many friends and caregivers for their care during George’s illness. A special thank you to Lisa Smith and all the Hospice nurses for their compassionate care. Rest in peace, Bro. Harris. We had a decent showing at the meeting tonight with 14 members and three guests. W.B. DeMott took a photo of us at the dinner table. He said, “to prove to your wives that you were actually here!”. 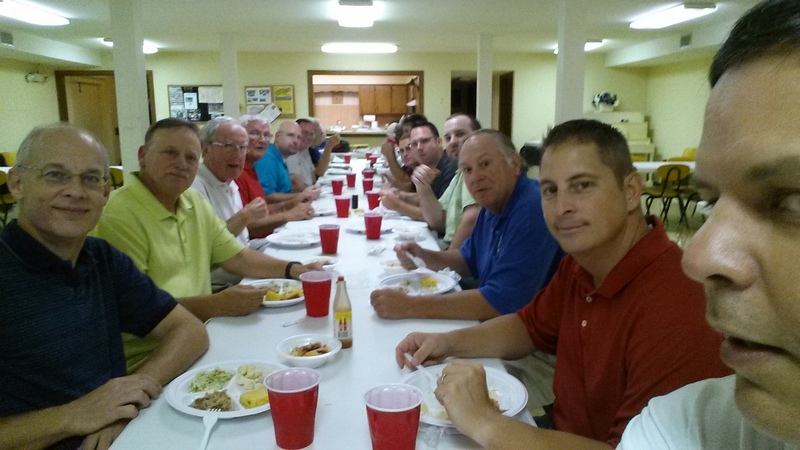 Thanks to B. Dolan for preparing the delicious meal last night – a barbecue dinner with all of the fixings. Brother William Lewis Ferrell passed away on Sunday morning, June 23. Brother Ferrell was a long time member of Millbrook Masonic Lodge #97. He was born on December 24, 1926. He was initiated as an Entered Apprentice on July 5, 1966, passed as a Fellowcraft on September 20, 1966, and raised to the sublime degree of Master Mason on November 7, 1966 at Millbrook Masonic Lodge #97. William “Lewis” Ferrell, 86, of Raleigh, passed away, Sunday morning, June 23, 2013 at Wake Medical Center. Born December 24, 1926, he was the son of the late Raymond and Hallie Ferrell. In addition to his parents, he is preceded in death by his 6 brothers and sisters. Lewis served in the National Maritime Service in WWII. He was a longtime member of Westminster Presbyterian Church in Raleigh, where he served as a Deacon, and the Millbrook Masonic Lodge #97. He retired from N.C. State University Physical Plant after 31 years of service. Lewis was an avid Wolfpack fan. He enjoyed fishing, hunting and camping. Some of his fondest memories were the births of his children, grandchildren and great-grandchildren, as well as his camping trip with Betty across the U.S.A.
Lewis is survived by his beloved wife, Betty Ferrell; daughters, Patricia Adams, and Cindy Johnson and husband Bob; grandchildren, Meredith Olski and husband Robert, Carla Nance and husband Bobby, Heather Johnson, Matthew Johnson and wife Lhoris; great-grandchildren, Sam and Zoe Olski, Jackson Nance, and William Johnson; sisters-in-law, Robbie McSwain, Ruby Doris Ferrell; and many nieces and nephews. A Funeral Service will be held 2:30 p.m., Wednesday, June 26, 2013 at Montlawn Funeral Home Chapel. Burial will follow at Montlawn Memorial Park. The family will receive friends at 6-7:00 p.m., Tuesday, June 25, 2013. The funeral will be at 2:30 pm on Wenesday, June 26 at Montlawn Funeral Home Chapel. Following the funeral, a Masonic graveside service will be performed at Montlawn Memorial Park. Please contact the Worshipful Master, Steve Beale at 919-971-0690 for further details regarding the Masonic graveside service. Hello everyone. We have a lot of events coming up. Most notably, our spring barbecue on Friday, April 26 (see post here for more details). On Saturday, March 23 we will have an envelope stuffing party at 9:00 am in the Millbrook Lodge room. The downstairs is rented that day, so please enter through the front door. It should only take about an hour if we get enough people, and the secretary will try to have coffee ready for everyone that morning too. To get ready for the spring barbecue we will be having a Lodge cleanup day on Saturday, April 6th starting at 9 am. We will need as many people helping as possible to get our Lodge in ship shape. Contact members of the Building & Grounds committee for more details. Several area Lodges will also be having charity fundraising barbecues. James B. Green Lodge will have a barbecue on April 5th. Archer Lodge will have a barbecue on April 19th. You can purchase tickets for the Archer Lodge barbecue from W.Bro. Max Bloodworth. Hello all, our spring barbecue will be held on Friday, April 26. We will start serving lunch at 11:30 am, and will continue until the food is gone. Plates will be $7 each, and include a hearty serving of the best eastern Carolina-style pork barbecue you’ve ever had, or half a chicken! Sides include potatoes, ‘slaw, and hush puppies. All of the proceeds go to the North Carolina Masonic Home for Children, and the Whitestone Masonic and Eastern Star Home Foundation. If you would like to support our cause, or if you just like barbecue, you can pay at the door, or you can buy tickets beforehand from any Millbrook Lodge #97 member for $7 a plate. If you an all of your coworkers would like barbecue delivered to your business, let us know. For more information on our barbecues, please visit our barbecue page. On Tuesday, December 24, Bro. Milton “Mickey” Lewis Bazemore, member of Millbrook Lodge, passed away. Bro. Bazemore was initiated to the Entered Apprentice degree on September 3, 1956, passed to the degree of Fellowcraft on November 19, 1956, and raised to the sublime degree of Master Mason on December 11, 1956 in Charity Lodge #5 in Windsor, NC. He affiliated with Millbrook Lodge #97 on March 18, 1969. Bro. Bazemore passed away on December 24, 2012. Bro. Bazemore’s Obituary was published in the News and Observer. Mickey L. Bazemore, 85, of Raleigh died Tuesday at Duke Raleigh Hospital. Born in Bertie County, he is the son of the late Luther P. and Eyssel Bazemore. Mickey was a graduate of Wake Forest University and owner-operator of A1 Appliance Co. for many years. He was a WWII Navy Veteran. He is survived by his wife, Eloise Hodge Bazemore; daughters, Ann Marie Bazemore and Cindy Jill Bazemore ; daughter-in-law, Deborah Bazemore. In addition to his parents, he was preceded in death by his, John Michael Bazemore in 2008. Funeral services will be conducted 11:00 a.m. Thursday, December 27, 2012 in the Chapel of Bryan-Lee Funeral Home, 831 Wake Forest Road, Raleigh. Burial will follow in Montlawn Memorial Park. Family will receive friends one hour prior to the funeral. The family thanks the PCU at Duke Raleigh Hospital for the wonderful care they extended to Mickey and his family. Memorials may be made to Samaria Baptist Church, 3621 Poole Road, Raleigh, NC 27610. Rest in peace Bro. Bazemore. All Millbrook Masonic Lodge #97 members, their spouses or significant others, and widows of Millbrook Lodge members. Dinner includes a choice of chicken marsala, veal cacciatore, or Italian sausage for the main course. There will be a side of spaghetti or salad, bread, and coffee or tea for drinks. Spumoni (Italian ice cream) will be served for dessert. A magician will be performing at each table during dinner. This event is semi-formal (coat and tie). Tickets for Millbrook Lodge members are $25 each. There is no cost for tickets for the ladies or widows. Payment for the tickets can be made at the event, or at the stated meeting on Tuesday, December 4th. We are limited to 50 seats, so an RSVP is necessary, please do so by emailing or calling W.M. Steven Dieckhaus at 919-601-7134. We hope to see many of our Ladies and members there. Happy Holidays! On Monday, November 12, Brother Briley passed away at his home in Raleigh surrounded by his children. Brother Briley was born on November 10, 1930. Brother Briley was initiated as an Entered Apprentice on June 16, 1961, passed to the degree of Fellowcraft on July 7, 1961, and raised to the sublime degree of Master Mason on August 26, 1961 at Thomas M. Holt Lodge #492 in Graham, NC. He affiliated with Millbrook Lodge #97 on February 18, 2003. He passed away on November 12, 2012. 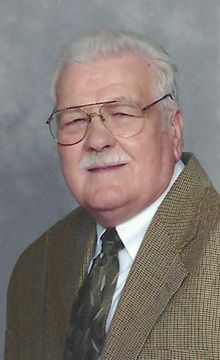 William “Bill” Frazier Briley, 82, of Raleigh, died on Monday, November 12, 2012 at his home, surrounded by his children. A native of Hickory, NC, he was born on November 10, 1930 to the late William Oscar Briley and Grace Estelle Frazier. Bill graduated from UNC-Chapel Hill undergraduate and law school, and was a veteran of the US Air Force. He was an attorney with the NC Attorney General’s office for much of his career, and a member of the Scottish Rite of Free Masons of North Carolina. An active member of Trinity Baptist Church, Bill will be remembered as a devoted husband, father and friend. He was preceded in death by his wife, Eleanor Smith Briley, and leaves to cherish his memory his son Robert Briley and wife, Linda, of Cary; son Reese Briley and wife, Kim, of Raleigh; daughter Mary Giallo and husband, Joseph, of Saratoga, CA; and daughter Leigh Panek and husband, Mark, of Manlius, NY. Also surviving are his seven grandchildren, Erin Briley, Matthew Briley, Lindsey Almond, Joseph Giallo III, William Giallo, John Panek and Caroline Panek. The family will receive friends Friday, November 16, from 1:30 – 2:45 at the Trinity Baptist Church narthex, 4815 Six Forks Road Raleigh, NC 27609. A memorial service will follow at 3:00 in the church sanctuary. In lieu of flowers, memorial contributions may be made to Trinity Baptist Church or to the . Rest in peace Brother Briley.